More balls, more fun as Mini Kickers gather on the pitch. In coach Greg Ehrman’s Green group, the players sat in a circle as Mr. Erhman introduced the concept of dribbling. One player mimed bouncing a ball with his hands. Right word, wrong sport. “There’s always a little bit of chaos [on the first day],” Mr. Erhman said after practice. 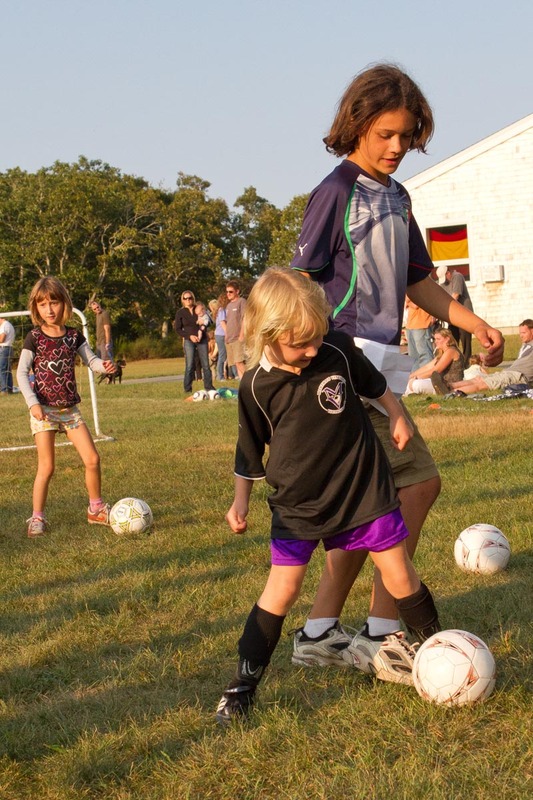 “This is where it starts,” said Martha’s Vineyard Youth Soccer vice-president Rocco Bellebuono as he watched the clusters of practice groups. There were eight groups, but only four coaches for the 70 or so Mini Kickers, and the volunteers had taken on larger-than-usual groups. Still, it was an improvement over last year, when there were four coaches and 90 Minis for most of the season. Sports, even at the youth level, tend to be associated with a particular time of year. In the spring, Little Leaguers and lacrosse players take to the fields; in the winter, hockey and basketball reign. 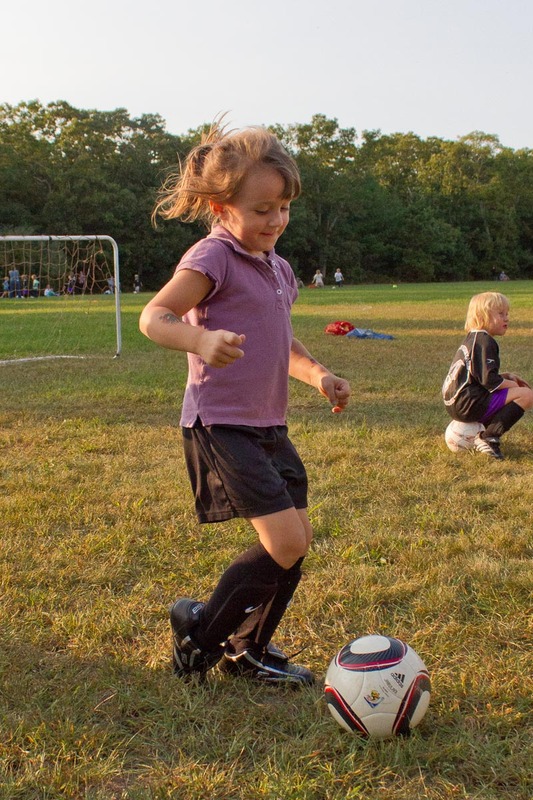 But only one sport holds the attention of Vineyard kids throughout the year: soccer. There are over 200 players in the fall leagues alone. 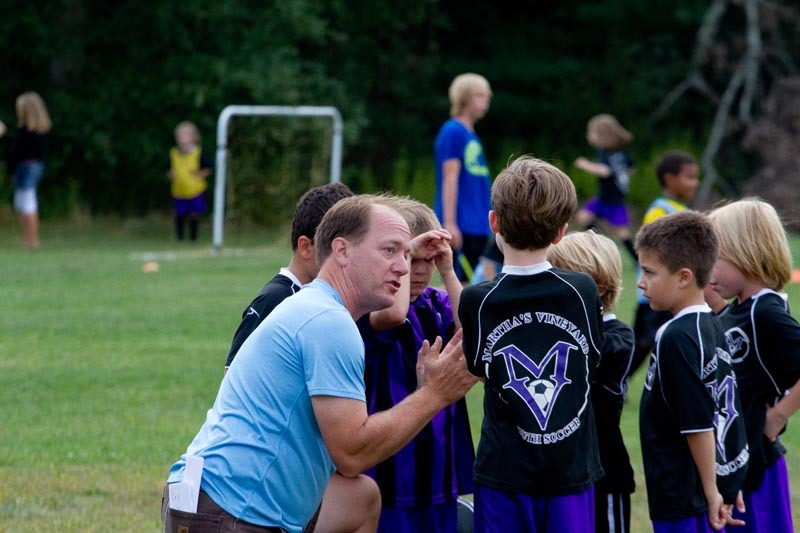 The youth program offers both recreational and travel soccer (MV United) in both the fall and spring; travel teams often continue to practice during the winter. High schoolers compete for the varsity and junior varsity teams in the fall, and stay with their travel teams in the spring. Last spring, the Under-16 boys team won the state championship, while the U-18 boys team advanced to the semifinals. The varsity boys’ team took home an Eastern Athletic Conference title for the first time ever. 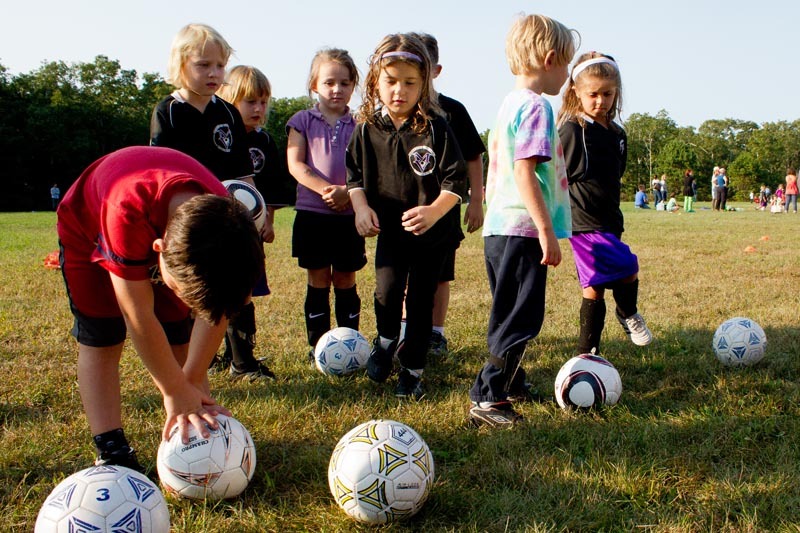 The recreational programs that dominate the fall scene — the Mini Kickers, U-8, and U-10 squads — are the root of that success. Mini Kickers learn to dribble and control the ball, U-8s focus on passing, and U-10s begin to coalesce into teams. 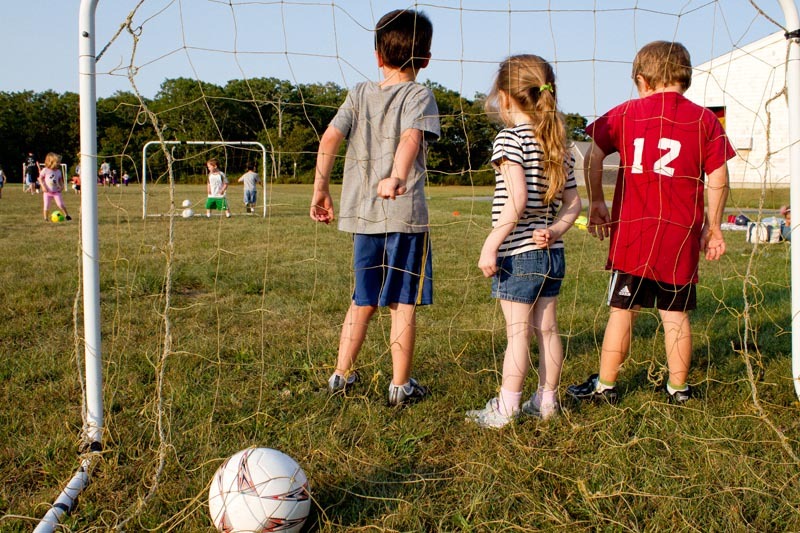 Of equal importance to learning the skills is simply having opportunities to touch the ball; that is, there are no lines of kids standing in front of a goal waiting around to kick something. The academy format of league soccer, instituted two years ago, places a great deal of emphasis on the links between the different levels, as well as making sure the skills and lessons learned within a given league are the same. The board of directors turned to its parent organization, Massachusetts Youth Soccer, for help devising practice plans and structures. They also did away with inter-town rivalries, opting instead to place competitive focus off-Island, with the travel teams. Mr. Bennett also coaches the high school girls’ varsity team. Boys’ varsity coach Damon Burke coaches the U-10 boys team in the spring. The eighth graders assisting Mini Kickers practice were, with the exception of Elias Fhagen-Smith, who just moved here, all once Minis themselves. The group was approached by Mr. Bennett because, as experienced travel players, they could help the Mini coaches, many of whom have never coached before. “We thought, what to do to get more adults involved [in Mini Kickers] is to bring in kids who do know the game,” Mr. Bennett said. While they receive community service hours for volunteering their time, most of the 11 middle schoolers on the field had already completed their requirements. “We don’t need the community service,” said Whitney Schroeder of West Tisbury. “I think we should give back to the program,” added Owen Hess of Edgartown. Like other youth sports, the soccer program offers not only the chance to learn sports skills, but also to meet new friends. 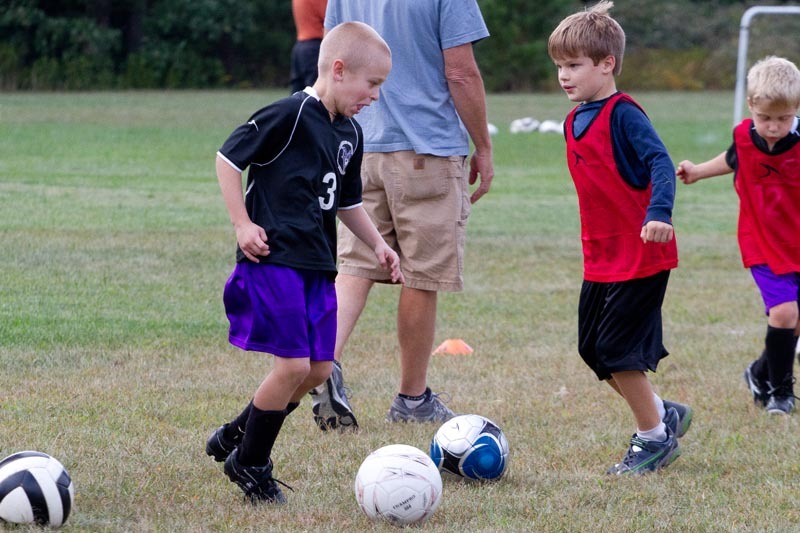 Jakie, who plays Little League in the spring, had just started his third season of Vineyard soccer. “He loves it,” Mrs. Glasgow said. Maureen Best of Vineyard Haven agreed. Both of her daughters, Maggie and Hannah, are involved in the youth programs; Maggie plays with Jakey in U-8s, and Hannah participates in travel soccer (the teams are co-ed at the recreational level). Hannah played for the first U-8 girls travel team in the spring. Mrs. Best was struck by the difference between the Vineyard team and some of the hypercompetitive squads Hannah’s group encountered when they traveled off-Island. “It’s fun,” said Ruairi Mullin, a U-10 player, as he watched younger brother Padraic practice on Tuesday. “I do it like every day,” said second-grader Tegan Gale, a Mini-Kicker veteran now playing with the U-8s. For more information on youth soccer, visit mvsoccer.org. Additional coaches are still needed.